Alisha Spielmann, Ryan McCurdy, and Ben Schnickel in The Butter and Egg Man. Photo by Kyle Connolly. 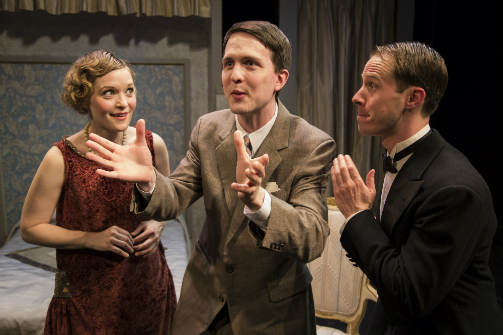 BOTTOM LINE: A well-done revival of the only play that George S. Kaufman wrote alone. The Butter and Egg Man, the only play that George S. Kaufman wrote alone, was a huge hit when it debuted in 1925, but it is seldom revived today. Does anyone even know what a butter and egg man is anymore? I didn't until I read the helpful glossary of 1920s slang in the program (the definition is "a naïve but rich investor, a sap, a mark"). The play is about producing a Broadway show, and many of these challenges still hold true to this day (Rebecca, anyone?). And a show with similar characters and themes, The Producers, was a blockbuster on Broadway in this century. Thanks to Retro Productions, now celebrating its tenth anniversary, audiences can see why The Butter and Egg Man was so popular in its day. Joe Lehman (Brian Silliman) and Jack McClure (Matthew Trumbull) are producing Her Lesson, starring an aging actress, Mary Martin (Shay Gines), as the ingénue. It has all the makings of a flop and they are out of money to pay the company, so they are in desperate need of a butter and egg man. They find Peter Jones (Ben Schnickel), a naïve young man from Chillicothe, Ohio, with dreams of being a Broadway producer. He recently inherited some money, but it's all he has left in the world, so he needs Her Lesson to be a success. There are lots of twists and turns which I won't give away, though you may be able to see some of them coming. I can see why this play isn't revived as often as some of Kaufman's collaborations. A lot of the jokes are dated and it's not as funny today as say, You Can't Take It With You, which he co-wrote with Moss Hart. But the cast members here appear to be having a blast and it's infectious. Director Ricardo Rust even makes the scene transitions fun to watch with some bits of Twenties choreography. This also distracts as the set converts from an office into a hotel room, an impressive feat for such a small space and probably budget (Jeff Standler designed the scenery). If you'd like to see this show and give to charity, the May 21st performance is in support of Red Nose Day, benefitting Children's Health Fund.